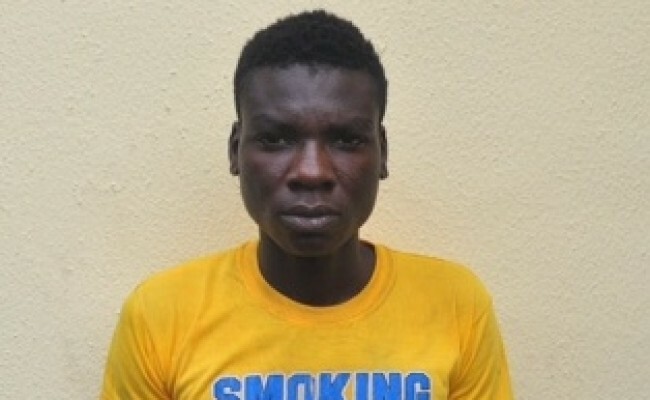 The 22-year-old gatekeeper, Tanko Abdulateef, who was arrested in Taraba State by officers of the Lagos State Police Command for killing his employer in the Lekki area of the state, has said that an evil spirit moved him to commit the crime. He made this known on Thursday when he was paraded at the Command headquarters in Ikeja. Abdulateef stabbed his boss, Mabel Okafor, 50, four times in the stomach at her apartment on Close 9, Victoria Garden City in the Lekki area on August 17, 2016. The woman’s phones, some cash and other valuables was also carted away after her murder. Abdulateef said he stabbed her with the scissors and the knife he had used to cut the flowers. I was employed in August 2016; I had not yet stayed up to a month when the incident happened. She agreed to pay me N18,000 at the end of the month. On that Wednesday, she had asked me to cut the flowers. When I was done, I went inside my room. There were only three of us in the apartment. She called me and I went inside the sitting room. I was with the knife and the scissors I had just used to cut the flowers. A spirit just came upon me and I stabbed her. She shouted my name and that was when I became conscious of what I had done. She was bleeding profusely. I had stabbed her in her stomach four times. When I realised that I had killed my employer, I packed some of her valuables and ran to my village in Taraba State the following day. I sat down at the doorsteps all night. I could not enter my room. Some of our neighbours, who were alerted by my boss’ noise, came around and asked what had happened. I lied to them that we saw a snake and she screamed. So they went back. I don’t know why I killed her. Something just came upon me. Abdulateef said that he had sold the phones before he was arrested. “I sold the three phones at N20,000 each in Taraba State because I needed money. I had not sold the clothes before I was arrested. My parents are dead, but I have two sisters. When I returned, I did not tell my family members anything. I didn’t kill her because of salary increment. We had both agreed on N18,000,” he said. The Lagos State Commissioner of Police, Fatai Owoseni, said that Abdulateef and another suspect would be prosecuted at the end of investigation. “The phones, trinket and other valuables carted away have been recovered from the suspect. The scissors and the knife that he used were also recovered from him. There is another suspect and the two of them will be charged to court at the end of investigation,” he said.